It’s been 28 years since Coney Hatch last released a record (Friction), 30 years since they did it (“Outta Hand) with their original lineup. 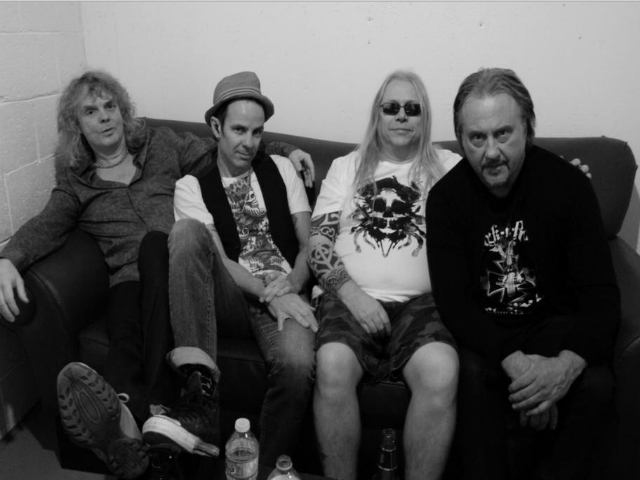 But to quote Thin Lizzy, “the boys are back in town” and lead vocalist/guitarist Carl Dixon, lead vocalist/, bassist Andy Curran, lead guitarist Steve Shelski and original drummer Dave Ketchum have reunited to release a high-voltage new record, (produced by Curran) titled simply Coney Hatch Four. It may have taken Dixon’s near fatal auto accident in Australia in 2008 to set the wheels in motion for this reunion but it seems old wounds have been patched up, and based on their recent live set at the Rock And Roar Festival in Spanish, Ontario, Coney Hatch is back with a vengeance. No furtive baby steps here, Coney Hatch deliver 11 solid, powerful tracks, quarterbacked by Ketchum’s driving drum beat and Shelski’s searing guitar riffs, Curran and Dixon drive through a batch of songs that feature hard-driving power rock (Connected, `We Want More’) with more commercially appealing mid-tempo anthemic numbers like their Angel City cover, Marseille’, the leadoff single `Blown Away’ and `Do It Again’. So what If FM radio isn’t playing new rock by established bands! Thanks to social media, who needs em. But to all classic rock fans (and we know you’re out there) you are encouraged to check this record out. It’s like Coney Hatch has emerged from a 1983 time machine and simply dusted themselves off. Now all they need is an opening spot on that next Iron Maiden tour!